Can Billionaire Paul Allen's Mega-Plane Really Launch Private Rockets Into Space? This image shows the planned Stratolaunch Systems carrier aircraft. After conquering the technology world, Microsoft co-founder Paul Allen is setting his sights on the next frontier: space. The billionaire entrepreneur announced a new private spaceflight venture on Tuesday (Dec. 13), called Stratolaunch Systems. The company aims to build a massive aircraft that will act as an airborne launch system, releasing a booster mid-flight that ignites to send cargo, satellites and, eventually, people into orbit. When complete, it would be the biggest aircraft in history. Sounds pretty cool, right? But can it really be built? The giant twin-bodied aircraft will be constructed by Scaled Composites, a Mojave, Calif.-based aerospace design company founded by industry pioneer Burt Rutan. The carrier craft will incorporate new aircraft components as well as existing parts from two 747 jetliners. The Stratolaunch Systems aircraft is expected to be the largest ever built. The craft's wings will span a staggering 385 feet (117 meters), which will make it longer than a football field. Tipping the scales at 1.2 million pounds (more than 544,000 kilograms), the mammoth aircraft will need to take off and land on a runway that is at least 12,000 feet (3,600 meters) long, company officials said. But, launching rockets from in the air comes with advantages. "It's an approach that has a long history," said former NASA administrator Mike Griffin. "We've been air-dropping manned rockets since Chuck Yeager. It's an approach that offers some very substantial operational flexibility, much reduced range requirements … ability to deal with weather scenarios." Griffin is a member of the Stratolaunch Systems board, and he joined Allen and Rutan in a news conference Tuesday in Seattle to announce the project. Commercial and government payloads will ride into orbit on a booster that will be made by the California-based Space Exploration Technologies (SpaceX). The two-stage rocket will be based on SpaceX's existing fleet of rockets, and it will be designed to first carry cargo and satellites, and then humans, SpaceX officials said. The booster will be released at an altitude of approximately 30,000 feet (9,100 m) before igniting and journeying into space. An artist's impression of the Stratolaunch Systems carrier aircraft releasing a rocket. This type of airborne launch system will help make commercial launches safer, more flexible, efficient and affordable, Allen said. 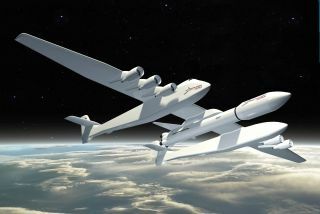 "By the end of this decade, Stratolaunch will be putting spacecraft into orbit," Allen said. Allen partnered with Rutan on the design and construction of SpaceShipOne, the first privately funded vehicle to reach the edge of space. Allen bankrolled the project, which reportedly cost more than $20 million. Allen declined to share the cost of this newly announced airborne launch system, but did say that it was a considerable amount. The importance of fostering the future of commercial spaceflight, however, is a worthwhile investment, he said. The mammoth aircraft will be built in a special hangar that will be constructed at the Mojave Air and Space Port, company officials said. Other than early specifications, Rutan is tight-lipped about details of the project. "Because we are announcing it very early, I don't think it's wise to give the competitors our technical numbers," Rutan said. "We have to share it after it's flying, but we don't have to now."